Some Christian Groups Are Offering Aid — And Salvation — To Nepalis : Goats and Soda The census showed no Christians in 1951. Today there are nearly 400,000. One reason: Some evangelical groups offer aid — desperately needed after the earthquake — and also seek converts. Tej Rokka is a Nepali pastor who works with the evangelical group Climbing for Christ. 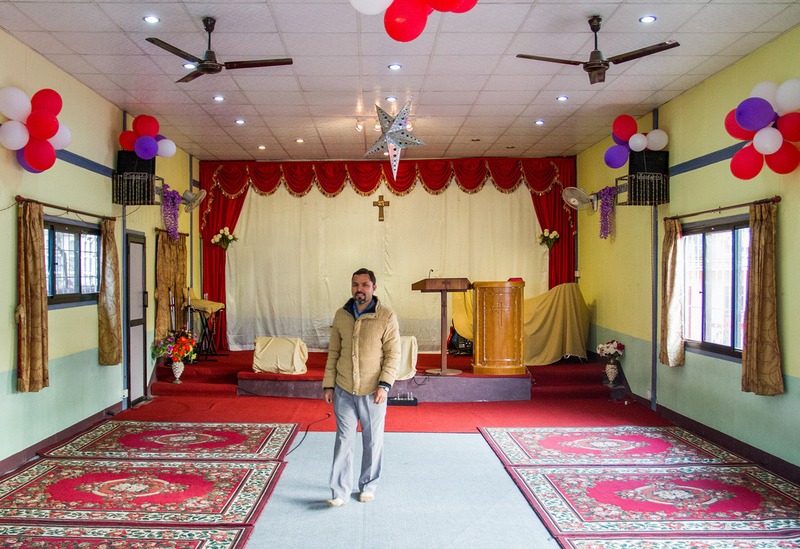 He's standing inside Savior Alone Redeems Asians church, in Kathmandu, where he preaches. Bishwa Mani Pokharel, news chief at Nepal's Nagarik newspaper, pulls out copies of the census to show the statistical gallop of Christianity across Nepal. It listed no Christians in 1951 and just 458 in 1961. By 2001, there were nearly 102,000. A decade later that number had more than tripled to more than 375,000. Pokharel and others think the increase is really much higher but inaccurately reported. "Before, when the Christians had a party, they slaughtered a chicken. Now, they slaughter a goat," says Pokharel, who has been reporting on the conversions. That extra meat, he explains, is necessary to feed all of the new people who've joined the guest list. A Swiss missionary talks to a Nepali woman about the Bible in Kathmandu's old city. Much of this growth can be attributed to Nepal's internal changes. Before 1950, Nepal was closed to foreigners. Mountain climbing changed that. And starting with the Maoist Civil War of the 1990s and culminating with the end of the monarchy in 2008, the country has transitioned from a Hindu kingdom to a communist-led secular republic with greater freedom of religion. Encouraging someone to convert to another religion was always illegal, but as Nepal eased away from its official Hindu status, the rules lightened up. Churches now mushroom throughout the Kathmandu Valley and across the terraced hills. Proselytizing remains illegal, but with political instability and weak law enforcement, that doesn't stop it from happening. Pledging to bring the Gospel "where others cannot or will not go," the group began its "Mission: Nepal" in 2008. In 2011, it dedicated the first church in the village of Dapcha, 25 miles east of Kathmandu. Today, Dapcha — with a population of just 1,000 families — is home to three churches. After the earthquake, C4C sent relief materials such as tents and money for food and first-aid items to congregants in Dapcha and other affected areas. Gary Fallesen, C4C's founder and president, and a team were also in Nepal in October helping rebuild the earthquake-damaged house that belongs to the family of Sumitra Pariyar, a young woman who believes she was healed from paralysis and seizures by her acceptance of Christ. Lauren Leve, a professor in the religious studies department at the University of North Carolina at Chapel Hill, is researching women who have converted to Christianity in Nepal. She found that as in the case of Pariyar, many of these conversions were related to illness. Others point to the Hindu caste system as an impetus. Though outlawed in 2001, caste discrimination is still widely practiced, particularly in rural Nepal, where people on the lower rungs suffer systematic abuse passed on between generations. Many converts come from these lower castes, and missionaries point to Christianity as a way to escape. "It's the only way out," says Fallesen. "Socially there's nothing they can do to change that and then we come along and we share about Jesus and the love he has for them." The system still exists, Fallesen says, but no longer has power over them. Nepali leaders aren't happy about the Christianity boom. Before the release of the country's first constitution this September, debates swelled over whether to scrap secularism and go back to an official Hindu designation. While Christians and other religious minorities feared a clampdown on religious freedom, the Hindu right insisted secularism would allow Christianity to take over. The British ambassador in Nepal ran afoul of this sentiment in 2014 after telling Parliament the right to change religions should be included in the constitution. Pro-Hindu groups accused him of supporting proselytizing and called for his resignation. When lawmakers did ensure secularism in the constitution, police needed water cannons and tear gas to dispel angry Hindu protesters. Leve thinks laws against proselytizing aren't the best way for the Nepali government to keep conversions down. "What it needs to do is ramp up the public health and social support infrastructure so that its citizens are getting what they need from the state," she says. "When public hospitals start to provide effective health services, when there's a social safety net in place post-earthquake or any other time, you will see fewer people expressing any interest in Christianity." For Fallesen, this need for material goods can be a foot in the door to a conversation about Jesus. He said his team starts by building relationships with villagers to find out what their problems are. "Usually the solution to those needs is to share about Jesus," he says. Rokka, the Nepali pastor who is also C4C's country representative, shows off the audio Bibles the team uses to minister to the illiterate in Nepal. People think the local language recordings of the New Testament are cellphones or MP3 players, he explained. He said that even when they find out what the gadget is, they're still excited to get a new device. Few avenues exist here for the rural poor to better their situation. For more than a decade, many parents have sent their children to "orphanages" in Kathmandu, where they hope they'll get better resources and education than what's available in their villages. The problem of false orphanages has grown so out of control that the U.S. and other countries banned international adoptions from Nepal in 2010. There were simply too many "orphans" with parents. C4C supports an orphanage, too. Not all the kids are orphans in the western sense, Fallesen explained, but they come from families that don't have the ability to properly care for them. How do these families feel about their kids getting baptized? "Some are happy, some are not. Some now want to take them out from the home," said Rokka, whose ministry runs the orphanage. But the parents don't typically act on their concerns, he added. "They have no way to help them. Anyway [the children] are getting help here, so [the parents] think, OK, let it be." Rokka came to the faith as a child after his mother died. He says some people convinced his father to send him and his brother to an orphanage run by an Indian missionary. Rokka estimates that 90 percent of the children he grew up with have since started their own ministries. Sitting outside their Dapcha house, an elderly couple expresses disdain for the churches popping up around them. "We don't go there," the woman says, waving her hand dismissively and mimicking someone in Christian prayer. She then pretends to handle Buddhist prayer beads. "We say 'om mani padme om,'" she says, using the Buddhist mantra to declare her faith. To Christian relief workers like Fallesen, the importance of bringing Nepalis to Christianity outweighs the concerns expressed by nonbelievers. "If I have a choice between possibly offending you or saying OK, whatever you believe is fine, but I believe in my heart if you don't believe in Jesus, you're going to go to hell, well, then I'm going to take the risk of offending you," he says. So C4C has its sights on more remote areas of Nepal. Land was just purchased for its newest church in the hard-to-reach far west district of Humla, where Fallesen says the Nepali population of seven Christian men has grown to 150 men and women. The church will be strategically placed at the point where Hindu and Buddhist pilgrims begin the trek to Mount Kailash, a holy site for both religions.